StarNet Communications Corp, (http://www.starnet.com/) a leading publisher of remote Linux and Unix visualization solutions today announced the addition of three Secure Remote Desktop modules to its flagship X-Win32 PC X server. The new modules enable X-Win32 to safely tunnel the remote desktops from Linux and Unix servers to the user’s PC over encrypted SSH. Traditionally, users of PC X servers deploy the XDMCP protocol to display remote desktop environments such as the Gnome and KDE desktops on Linux servers and the CDE environment on Solaris Unix machines. XDMCP is used primarily on company Local Area Networks as it is a both unsecure and does not work over the Internet. 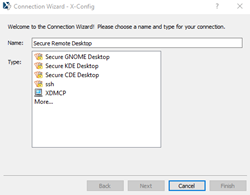 The new Secure Gnome, KDE and CDE Desktop modules in X-Win32 allow the remote desktop to be transmitted securely using the SSH encryption protocol. While it has always been possible to do this, most end users are not familiar with the needed Linux and Unix commands required to set up such remote desktop access connections. The new modules automate this process. The end user only supplies the login and password of his/her account on the remote server. X-Win32 is a traditional (legacy) PC X server solution that enables Windows users to log onto remote Linux and Unix servers to display and operate various applications that are installed on the remote system. After more than 30 years since the market for PC X servers developed in the early 1980s, this client-only solution continues to be widely used in high-end engineering markets such defense, aerospace, semiconductor design and geological exploration. In the past 10 years, more advanced client-server solutions, such as StarNet’s line of FastX products, have taken over much of the remote X11 visualization market. Client-server solutions offer users the critical ability to reconnect to their remote applications after a network interruption or system crash. They also perform at near LAN speed when connecting over the Internet. Still, on corporate LANs, X-Win32 remains a leading solution. The new X-Win32 version can be downloaded with a 30-day free evaluation license from the http://www.starnet.com/xwin32/ Despite the addition of advanced new capabilities, the X-Win32 list price remains at $285 in single license quantity. Volume, government and educational discounts are available. StarNet offers named-user and floating (concurrent) users licensing options.